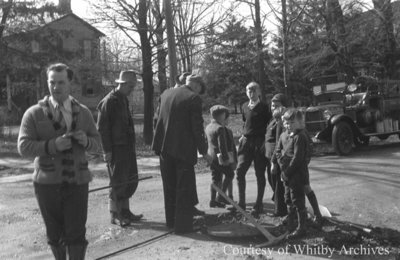 A black and white negative of men and children standing around a sewer grate on a street in Whitby, Ontario. The men are preparing to clean out a sewer main blockage that occurred on April 23. No specific year was given. In this view Cecil Greenfield is walking towards the photographer. Spring Sewer Main Cleanup, c.1938, Marjorie Ruddy. Whitby Archives A2013_040_730A.